Nannies are employees of the families they work for. They are not independent contractors, whether the family or nanny wants to be or not. Families sometimes try to completely side step their employment tax obligations by giving the nanny a 1099 form at year end. In so doing, they avoid paying their share of Social Security and Medicare taxes, as well as unemployment taxes, and they push their tax obligations on to the nanny. This path allows the family the benefit of child care tax credits without the corresponding expense of paying their portion of the employment taxes. Nannies are fighting back. A few years ago a nanny received a 1099 from her employer, a well known figure in the entertainment industry. She had negotiated a payment NET of taxes with the employer, and received her net pay as promised. At the end of the year (and after she had left their employment) she received a Form 1099. When she took the 1099 form to her tax preparer, she almost cried when she found out how much tax she owed. She followed the tax preparer's advice and did two things - paid the tax AND filed a SS-8 form, Determination of Employee Work Status for Purposes of Federal Employment Taxes. She stated she had been employed as a nanny, and that according to IRS regulations, her employers had improperly identified her as an independent contractor to avoid employment taxes. Three years later, she received a refund of ALL of her Social Security and Medicare Taxes (15.3% of her gross wage or 'self employment tax') back as the IRS agreed with her that she was misclassified. Happy day for the nanny. The IRS then presented the employer with a bill for all Social Security & Medicare taxes - both employee and employer portions - along with calculated penalties and interest. The moral of the story - nannies can and will fight back. It is best to set up your nanny taxes correctly up front and avoid the hassle completely. 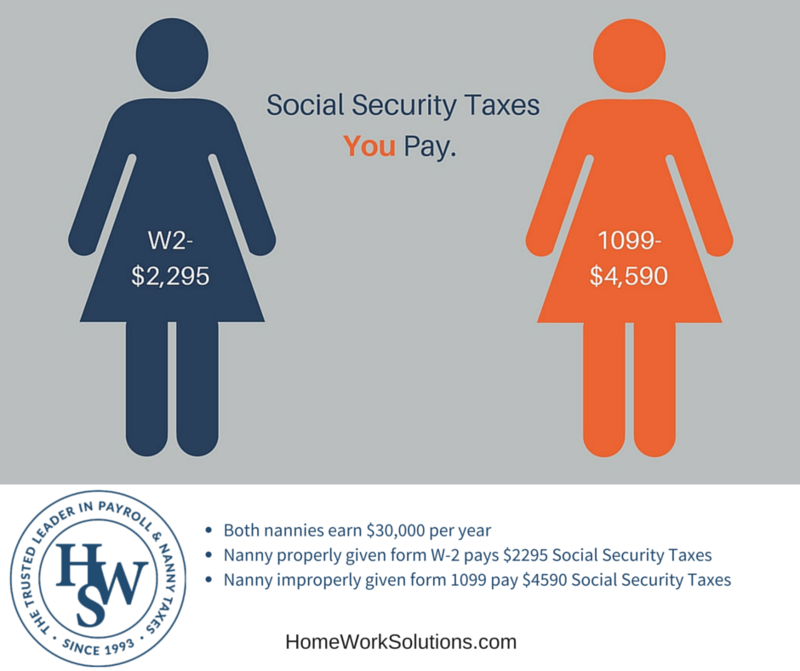 Your nanny is entitled to a Form W-2 at year end, and you are responsible for the remittance of all Social Security and Medicare taxes. The IRS is unambiguous on this - see IRS Publication 926. It does not matter if the nanny lives in or lives out, is full time or part time, or how she is paid. If you paid her $1800 or more in 2012, she is due a W-2 form. Employee Misclassification is a major enforcement priority at the Federal level (US Department of Labor) and at the state level. Tax revenue from unemployment taxes - an employer obligation for all employees - is strained to meet unemployment claims. Thirteen states, the US Department of Labor, and the Internal Revenue Service entered into formal information sharing agreements in 2011, all intended to speed up collections and enforcement when employers try to classify an employee as an independent contractor and skip their employment tax obligations. A W-2 form is due to any household employee who received $1800 or more in wages in 2013. In 2014, the threshold for an employee needing to report taxes increases to $1900 or more.